I think I’ve attended all of the National Community Reinvestment Coalition’s (NCRC) annual conferences since 1992. This year’s theme was again “Creating a Just Economy”—an appropriate and timely admonition. Franklin D. Roosevelt’s test surely was not pursued in the first 100 days of the Trump presidency. After countless trips to D.C., I finally made time to visit the memorials for Dr. King, FDR, and Jefferson, and found particularly relevant quotes at each stop. The FDR quote above was etched by a sculpture of Americans forgotten in the Great Depression. I wondered whether the Americans who suffered the injustice of our most recent Great Recession haven’t already been not only forgotten but abandoned by the White House and Congress, despite their votes. Though 2017 marks 40 years since Congress passed the Community Reinvestment Act (CRA) to ensure fair and responsive community investment, redlining isn’t dead, and will become rampant again if the Trump administration and Congress collude to deregulate financial services. Our country won’t be great again; it will be broke again by Wall Street greed. 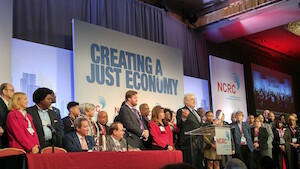 As such, NCRC’s 2017 conference may have been “last call” to hear from responsive bank regulators such as keynote speakers Janet Yellen, chair of the Federal Reserve, and Thomas Curry, comptroller of the currency. Richard Cordray, director of the Consumer Financial Protection Bureau, is under siege with efforts to repeal protecting consumers, and he was presented with the NCRC’s Representative Henry B. Gonzalez Award, which recognizes the most outstanding government official. But “creating a just economy” is not just a matter of federal policy or tax reform. Just economies are threatened locally by every decision in our communities to forsake those who have too little affordable housing and insufficient employment to raise a family. Equitable development is imperative for a just economy. Given the challenges confronting Chicago’s Uptown community, where I now work as CEO of the Institute of Cultural Affairs [ICA]-USA, I volunteered to moderate a workshop titled “Equitable Development in Gentrifying Communities.” Panelists shared similar stories from Portland, Oregon; Roxbury, Massachusetts; New York City; and Washington, D.C.
Empower DC’s mission is to enhance, improve, and promote the self-advocacy of low- and moderate-income D.C. residents in order to bring about sustained improvements in their quality of life. The presentation by executive director Parisa Norouzi included describing the organization’s work with the historic Ivy City community to restore the Alexander Crummell School. Named for abolitionist, educator, and clergyman the Rev. Dr. Alexander Crummell, whose life’s mission was the uplift of Black people, it was the first public school for African Americans in D.C. when it opened in 1911. Residents of Ivy City have long been on record asking that the school be turned into a multi-use center to serve youth and elders. They have endured years of testifying at hearings, participating in city planning meetings, and mobilizing community participation. They experienced many broken promises, and even had to file a lawsuit to block attempts to turn Crummell into a bus parking lot. Last year, Empower DC worked with Ivy City residents and partners to submit a proposal that would turn the historic Crummell School and one acre of the site into a Community Land Trust, keeping the grounds open for community recreational use (with a playground/splash park, basketball court, walking trail, and garden) and opening the school as a nonprofit community center with a mix of programming to meet the needs of youth, adults, and seniors. The school building would become a community square surrounded by new affordable housing. Unfortunately, local government is forsaking Ivy City’s community dream and choosing a proposal for the site to become another high-end development striving to be D.C.’s newest “hot” real estate. When President Trump tells us how “huge” his accomplishments have been in his first 100 days, let’s ponder the “huge” decisions being made in planning departments and mayoral offices across our country to not provide enough housing and jobs for those who have too little. Many politicians are failing the equitable development test. Our civic duty is to grade accordingly. Image from the NCRC conference courtesy of author.